Once again the ‘end of term’ approaches to conclude yet another successful year for our Society. We have just two more lecture meetings in the current session. The next lecture of the session takes place on Thursday April 21st at which Jerry Stone (Spaceflight UK) asks the question: IS PLUTO A PLANET? The final lecture of the current session is on May 19th when Dr. Tony Waltham of Geophotos will describe to us : GEOLOGICAL HIGHLIGHTS OF THE ANDES. The final meeting of the session is the ANNUAL GENERAL MEETING which will take place on Thursday June 23rd with the usual wine & cheese and a scientific entertainment, for which there is a small charge of £3. Contributions of food will be gratefully accepted, the Society provides the wine. Council invites further nominations for the above posts. Such nominees should be duly proposed and seconded and should have agreed to serve if elected. Under the revised Constitution, Council will replace one ordinary member, from those who have served longest, each year. At the Council meeting on April 7th Martin Williams was due to retire but David Brandt expressed the wish to resign instead. We thank David for his support and hope that he will return to Council in the future. This leaves a vacancy for one ordinary member of Council. Thomas J Phillips writes in Nature about our lack of understanding of antimatter. It is generally understood that the Big Bang at the beginning of our Universe produced equal quantities of normal matter and antimatter. Also we believe that when the two types of matter come together they annihilate each other; we observe experimentally, for example, that positrons (antimatter electrons) emitted during radioactive decay are annihilated when they collide with ordinary matter. We also observe that when galaxies collide they do not annihilate, but merge, leading to our conclusion that all the galaxies are made of normal matter. So where is the missing antimatter? Dr Phillips considers that we need to find out a lot more about antimatter, particularly its gravity. When we are dealing with charged antimatter particles such as positrons or antiprotons we can handle them using electric or magnetic fields. But we cannot do this so easily if they have a neutral electrical charge, as we think antihydrogen would have, by analogy with normal hydrogen. Another article in the same issue of Nature reports confirmation that this is so, using the ALPHA apparatus at CERN that traps antihydrogen atoms. They have been able to measure their charge to an accuracy 20 times better than previously reported and find it less than one billionth of the charge on an electron – essentially neutral. This is important as it opens the possibility of measuring the gravity force of antihydrogen; such forces are so very much weaker than electromagnetic forces that we could not measure them if electrical forces were present. Dr Phillips points out that, in addition to the missing antimatter, there are three other big mysteries in astrophysics: dark energy, dark matter and cosmic inflation. These three have all been invented as ad hoc solutions to cosmological problems that do not fit the predictions of general relativity. Dark energy is needed to explain why the cosmic expansion is not slowing down; dark matter to explain why galaxies are rotating too fast to be bound by the gravity of the visible matter; cosmic inflation is needed to explain how all parts of the universe are at the same temperature when the Big Bang occurred too quickly for such causal connection. He considers that these problems may well be explained by a single change to our theory of gravity that should be tested in antigravity experiments. He points to the Dirac-Milne cosmological model, which is based on the assumption that the Universe has equal amounts of matter and antimatter that repel each other gravitationally, contrary to the predictions of General Relativity. Currently all observed galaxies are thought to be formed of matter because they are seen to collide without annihilation. “But if matter and antimatter repel each other, they would never collide, so the missing antimatter could be hiding in plain sight” (Dr Phillips’ own words). Furthermore, this model of the Universe would have zero net gravitational charge, so dark energy would not be needed to explain why the expansion is not slowing down. Such a “coasting” universe would not need inflation because its expansion would have been slow enough for the entire universe to have been causally connected. We clearly need a new General Theory – Any offers from Hampstead? SOME FURTHER THOUGHTS: Perhaps I can add a personal speculation, I do not think it would be sensible to revert to Newton’s gravitational system since it is unable to provide the detailed explanation in our knowledge provided by Einstein’s General Theory based on the geometry of space-time; and Einstein’s prediction of the generation of gravity waves in 1916 has only now, 50 years later, been confirmed. I think myself that we can manage with a very minor variation of Einstein’s theory. You will remember that his theory was often explained to non-experts by the analogy that space-time was a thin rubber sheet which was depressed by matter such as stars and planets and thereby caused their motions to be changed as if there were a force of gravity. So the variation I propose is that anti-matter would cause an elevation in the rubber sheet analogy instead of a depression. An anti-matter galaxy would behave similarly to a matter galaxy and seem to be identical in our view from a distance. But the difference between depression and elevation would ensure that they would never collide. We need to analyse galactic motions to confirm this and show which is matter and which is antimatter. So Mars is NOT dry after all! For years now we have been saying that there is overwhelming evidence that in the past water was abundant and flowed on Mars but although there might be a small residue left frozen in the polar caps and perhaps in the form of permafrost below the surface, it doesn’t flow today – well how wrong were we? Images taken by Mars Reconnaissance Orbiter, (MRO) many months apart show clearly downward moving streaks called linae, on the walls of the craters Horowitz and Garni. These linae were first spotted 5 years ago but only recently seen for what they are. They are of course not just simple water but highly concentrated brine which reacts with the changing Martian seasons, freezing in the winter months and slowly flowing down hill as temperatures rise. The MRO’s spectrometer indicates a high concentration of calcium perchlorate which seemingly acts like an anti-freeze allowing the brine solution to flow. Not nice fresh water perhaps, in fact decidedly brackish, but it could still be good enough for some hardy species of extremophiles to exist. Here on Earth, certain strains of bacteria have been found locked up in salt crystals from vast salt lakes awaiting water to release them, and they revive despite having been locked up for over 90,000 years! There are two new spacecraft missions to Mars which lifted off in March 2016. On the 5th a joint Russian and European project was successfully launched from Kazakhstan on its way to examine the methane plumes that seem to occur seasonally in some regions. 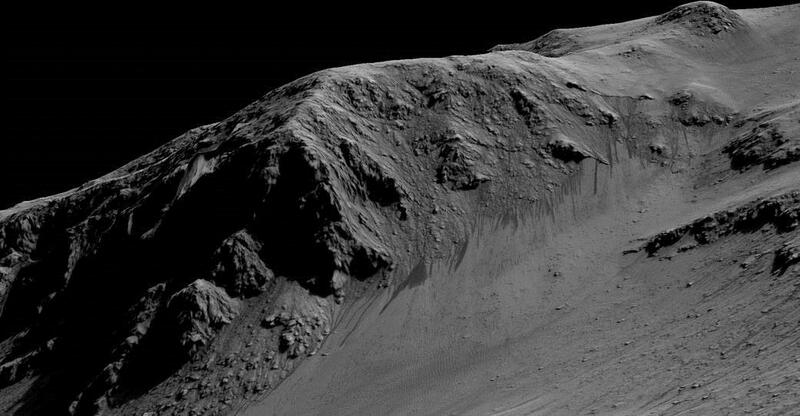 These may indicate a biological origin suggesting the presence of actual living organisms, but they could also originate from geological processes – residual volcanism for example; although the received wisdom is that Mars is no longer ‘geologically’ active. The Trace Gas Orbiter, (TGO) will hopefully identify areas where methane is being generated and these regions will be visited later by the ExoMars rover due to follow in 2018. The TGO mission will also deliver the Schiaparelli lander to its landing site in Meridiani Planum where it will monitor dust levels in the atmosphere, atmospheric temperature and electrification. With 6 missions currently in progress and others planned for the future, new discoveries are certain. The lure of the Red Planet continues. Mars is in opposition this year – on May 22nd. But it is an unfavourable opposition for northern hemisphere observers due to the low declination of the planet and its small size at around 18 arc/secs at best.